Kwanko‘s 200 staff members met in Bourg-la-Reine on September 28 to inaugurate the group’s new headquarters. Not only were the offices renovated, but work methods were also revised in order to meet employees’ new expectations. The professional world is evolving, and so is the office organization! 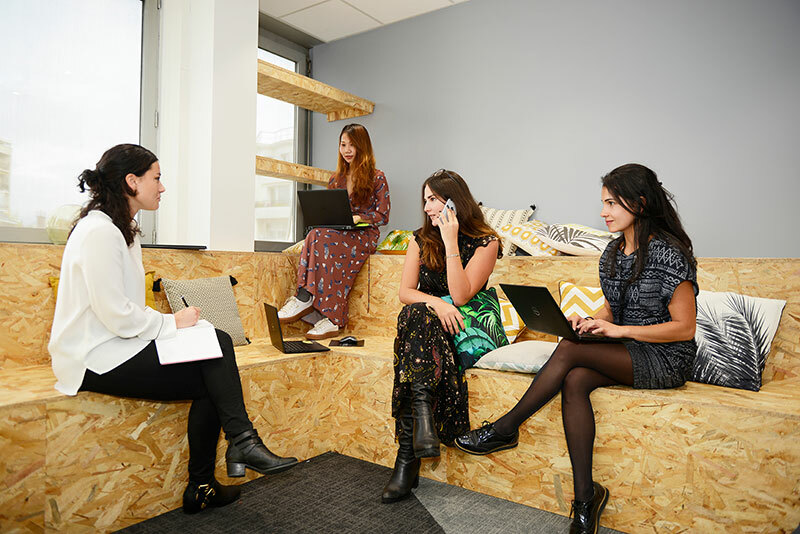 Based on the many studies showing an inextricable connection between office layout and workplace wellbeing, the Kwanko Group has transformed its offices (flex office, a home-like feel, etc.) in order to better meet its employees’ needs. Kwanko is rolling out this new organizational structure in its headquarters and will extend it to its international branches. 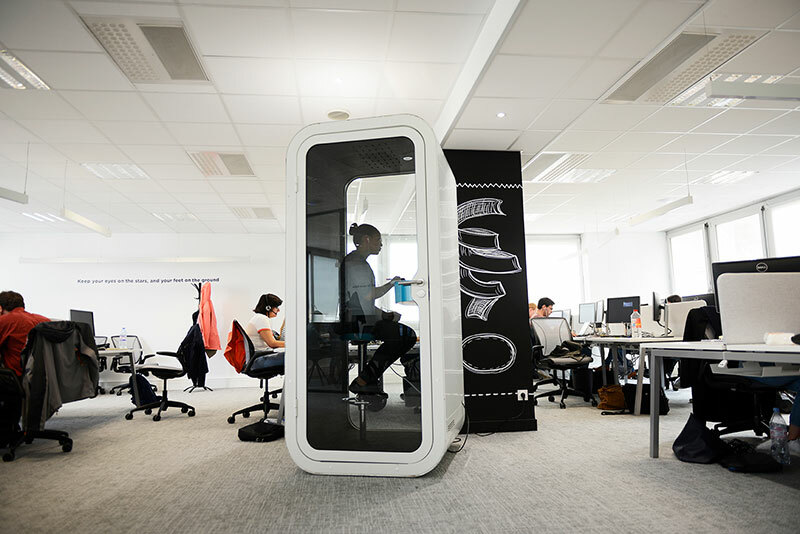 The “flex office” concept has been key to the redesign of the premises. 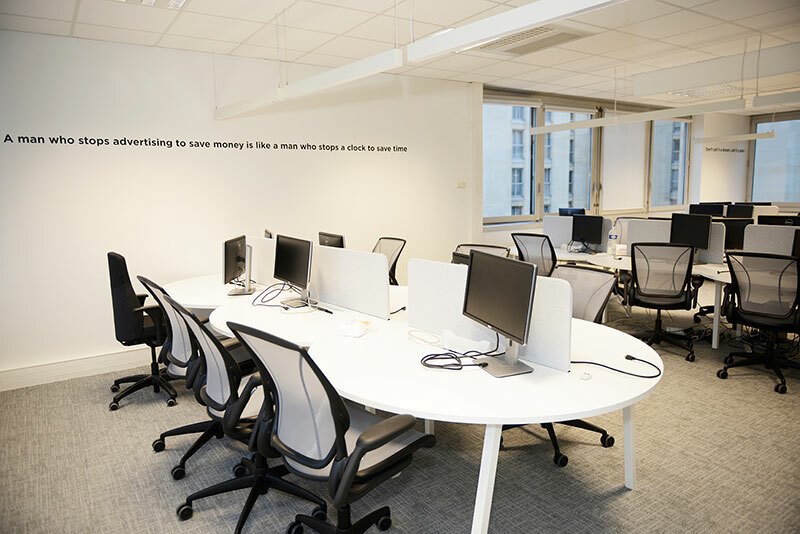 Partitions have been removed from the offices in order to promote conversation among employees. Above all, though, the number and variety of collaborative spaces (cafeteria with a foosball table, various meeting rooms, phone booths in the middle of the open-concept space, “silence” room for quiet isolation, etc.) have increased so that each employee can work and relax according to his/her own needs and wants. The plain old office with a green plant and a photo of one’s dog is no more! Moving forward, it’s possible to change work spaces every day. Organize a videoconference, lead a team meeting, entertain clients, or make a phone call without disturbing co-workers… All of these situations were considered in order to facilitate employees’ daily tasks. Another novelty to promote a “home-like feeling” and employees’ well-being: the recruitment of a “happiness manager,” whose role involves internal communications, human resources, and special events. 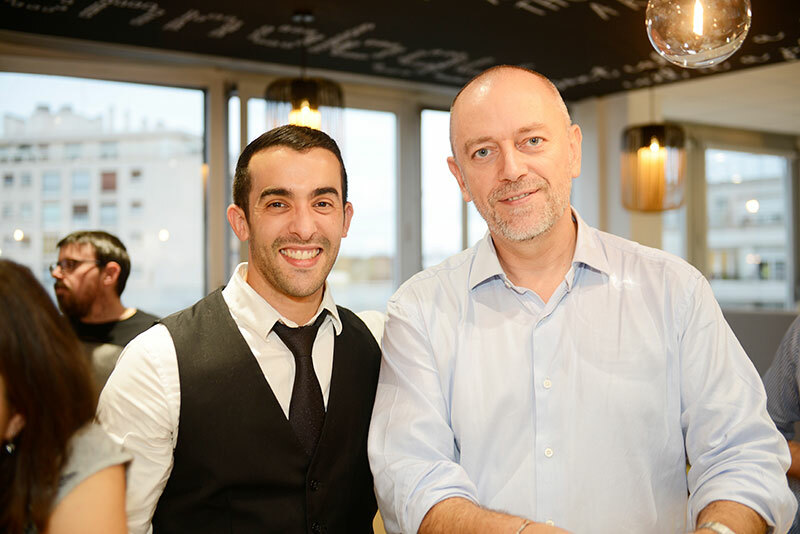 “This new staff member organizes events aimed at ensuring cohesion among employees, and for being particularly attentive to individual situations,” explains François Bieber, CEO of Kwanko. As one might imagine, office redesign and a change in work habits have also resulted in the introduction of new tools that combine “fun and efficiency.” “For example, we no longer have landline phones,” notes François Bieber. 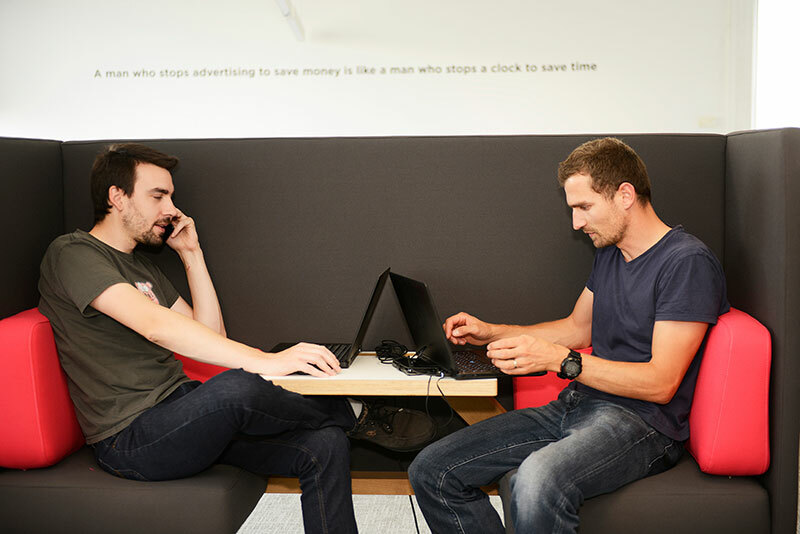 “We communicate primarily on Hangout, we use a softphone and we work in real time, collaboratively, with tools such as Slack.” It’s a real revolution, particularly appreciated by employees. Kwanko sought to accentuate the “home-like feeling,” particularly through the layout of fun, informal meeting and relaxation spaces. 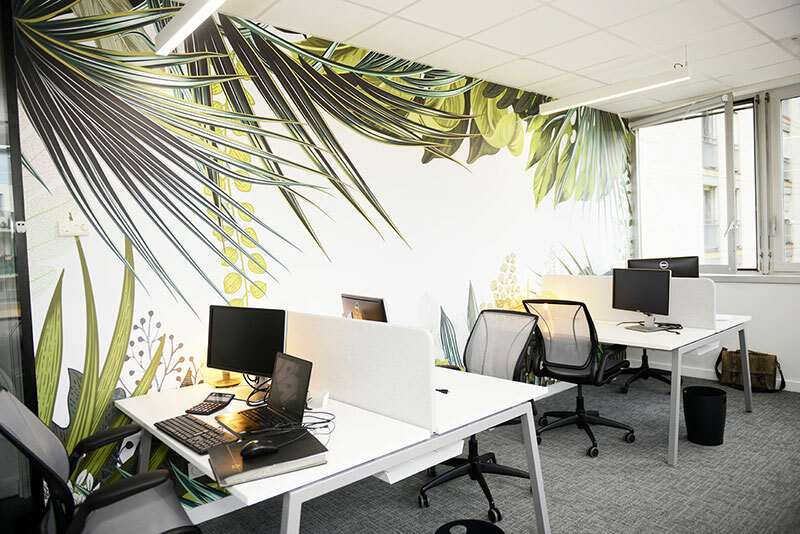 As its name indicates, the “silence” room, adorned with a jungle-print wall decoration, allows employees who so desire to work in a calm environment and concentrate on a specific task. The new workspaces are bright and open-concept, promoting collaboration among employees. No offices are assigned. In the morning, you settle in wherever you like, perhaps next to specific associates if you are working together on a particular project. Improving well-being in the workplace necessarily involves finding a good work-life balance. 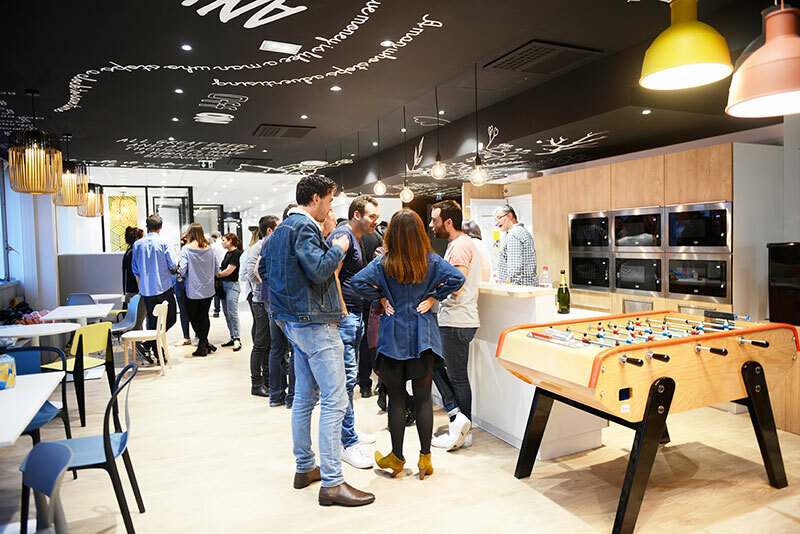 When it’s time to break up the routine, there’s nothing like a well-equipped cafeteria, a foosball table to relax, or parties where you can talk about anything — except work! For an informal check-in with a colleague or to organize a meeting on the fly, this kind of comfortable, trendy alcove is appreciated. Located right in the middle of the office spaces, Phone Booth 2.0 allows you privacy to make a phone call.